Genocoured the initiative to run the Powerhouse Reversible Turbines for the first time to use the water released to the Krishna Delta via the Nagarjuna Sagar Project Power House. 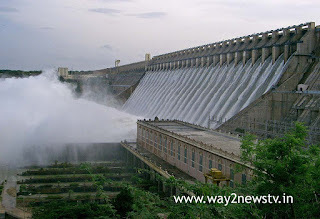 The Sagar Tail Pond is built on the Tail Pond Reservoir with the construction of the Sail Tail Pond and the water level is increased and the Backwater Sagar Project Power House strikes. The Jenko administration is trying to generate electricity through the reversible turbines. The power house is targeted at 815 MW power through eight units. A unit was developed by BHEL technology in 1972 during the powerhouse construction, but there is no reverse turbines. There are also reverse turbines systems in the remaining seven units from Japan. Janco also intended that the reverse turbines should be the first to take advantage of the backwater water available to the powerhouse through the Sagar Tail Pond, although not yet used. Should you take a look at the reversionable turbines management process and continue the production of electricity? Whether or not? Genco officials said that Genco CEDi Prabhakaravu Sagar Powerhouse will be visited today to look into the issue. The next decision will be on reviving the reverse turbines, according to the CMD. Genco officials say the cost of reversible turbines hydroelectric power production is higher compared to the cost of generic hydroelectric power. Genco's power to generate electricity through reverse turbines is the first time in power house history.